Definition at line 7 of file blinkDetector/windows/FilterSrc/FilterInterface.cpp. Definition at line 13 of file blinkDetector/windows/FilterSrc/FilterInterface.cpp. Definition at line 53 of file mpisearch/windows/FilterSrc/FilterInterface.h. References ObjectList::begin(), color, MPColorTools::DrawRGBBox(), ObjectList::end(), RGBCOLOR, TSquare::size, Square, TSquare::x, and TSquare::y. Definition at line 52 of file eyefinder/windows/FilterSrc/FilterInterface.h. References VisualObject::begin(), color, MPColorTools::DrawRGBBox(), VisualObject::end(), FaceObject::eyes, RGBCOLOR, VisualObject::x, bEyesObject::xLeft, bEyesObject::xRight, VisualObject::xSize, VisualObject::y, bEyesObject::yLeft, bEyesObject::yRight, and VisualObject::ySize. Definition at line 41 of file colortracker/windows/FilterSrc/FilterInterface.h. References ObjectList::begin(), color, MPColorTools::DrawRGBBox(), ObjectList::end(), FaceBoxList, faces, MPColorTracker::getActivation(), MPColorTracker::GetColorBox(), MPColorTracker::GetLastFaces(), MPColorTracker::GetMissedFrames(), RGBCOLOR, TSquare::size, Square, TSquare::x, and TSquare::y. Definition at line 59 of file blinkDetector/windows/FilterSrc/FilterInterface.h. Definition at line 32 of file mpisearch/windows/FilterSrc/FilterInterface.h. References RImage::array, RGBTRIPLE, and y. Definition at line 31 of file eyefinder/windows/FilterSrc/FilterInterface.h. Definition at line 38 of file blinkDetector/windows/FilterSrc/FilterInterface.h. Definition at line 44 of file blinkDetector/windows/FilterSrc/FilterInterface.cpp. References DrawBoxes(), m_failedCycles, and ShowBlinkResults(). Referenced by MPFaceDetectorFilter::Copy(), MPEyeFinderFilter::Copy(), MPColorTrackerFilter::Copy(), and MPBlinkDetectorFilter::Copy(). Definition at line 20 of file blinkDetector/windows/FilterSrc/FilterInterface.cpp. References blink, MPBlink::findBlinks(), GreyScaleFlipVideo(), m_faces, m_failedCycles, m_failedSearch, m_lastFace, m_pixels, RGBTRIPLE, RImage::setSize(), VisualObject::size(), and wt_avg. 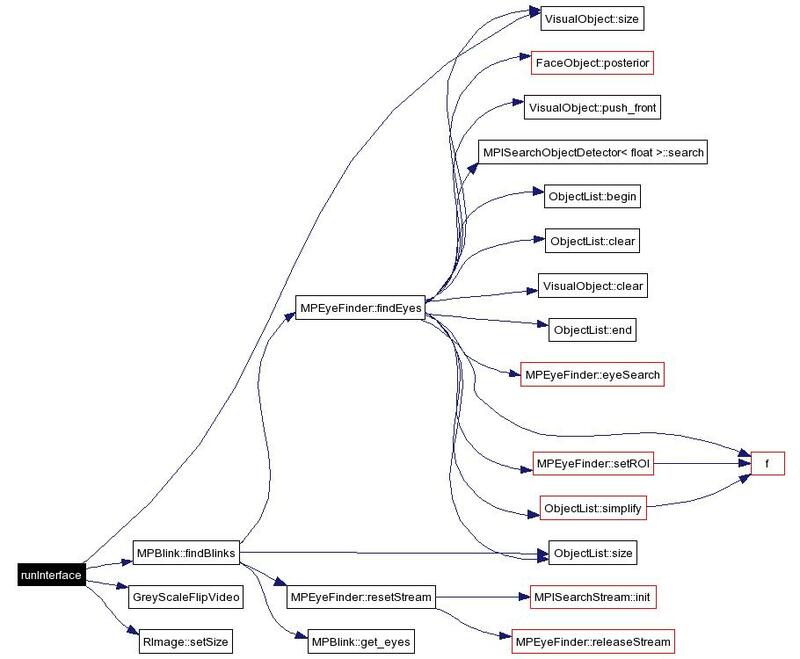 Referenced by MPFaceDetectorFilter::Transform(), MPEyeFinderFilter::Transform(), MPColorTrackerFilter::Transform(), and MPBlinkDetectorFilter::Transform(). Definition at line 93 of file blinkDetector/windows/FilterSrc/FilterInterface.h. 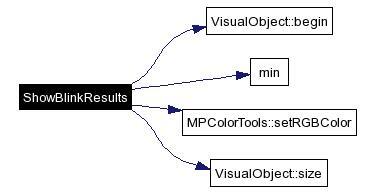 References VisualObject::activation, VisualObject::begin(), i, max, min(), RGBBLUE, RGBRED, RGBTRIPLE, MPColorTools::setRGBColor(), VisualObject::size(), VisualObject::xSize, and y. Definition at line 24 of file blinkDetector/windows/FilterSrc/FilterInterface.h. Referenced by FilterInterface(), and runInterface(). Definition at line 26 of file mpisearch/windows/FilterSrc/FilterInterface.h. Definition at line 35 of file colortracker/windows/FilterSrc/FilterInterface.h. Definition at line 21 of file mpisearch/windows/FilterSrc/FilterInterface.h. Definition at line 21 of file eyefinder/windows/FilterSrc/FilterInterface.h. Definition at line 25 of file blinkDetector/windows/FilterSrc/FilterInterface.h. Definition at line 23 of file mpisearch/windows/FilterSrc/FilterInterface.h. Definition at line 22 of file eyefinder/windows/FilterSrc/FilterInterface.h. Referenced by runInterface(), and ~FilterInterface(). Definition at line 27 of file mpisearch/windows/FilterSrc/FilterInterface.h. Referenced by printFrame(), and runInterface(). Definition at line 28 of file mpisearch/windows/FilterSrc/FilterInterface.h. Definition at line 37 of file colortracker/windows/FilterSrc/FilterInterface.h. Definition at line 24 of file mpisearch/windows/FilterSrc/FilterInterface.h. Definition at line 23 of file eyefinder/windows/FilterSrc/FilterInterface.h. Definition at line 25 of file mpisearch/windows/FilterSrc/FilterInterface.h. Definition at line 24 of file eyefinder/windows/FilterSrc/FilterInterface.h. Definition at line 28 of file blinkDetector/windows/FilterSrc/FilterInterface.h.